I have always seen Samson products all over the place especially in pro audio/ musical instrument stores but have never given any serious thought of buying anything with this brand name due to either being so much more inexpensive than the competition with certain products or just a sheer lack of hype in audiophile circles. I think that common human trait of disregarding inexpensive things and automatically thinking that they are inferior is typical but I think I may have to rethink things if this turns out to be any good. 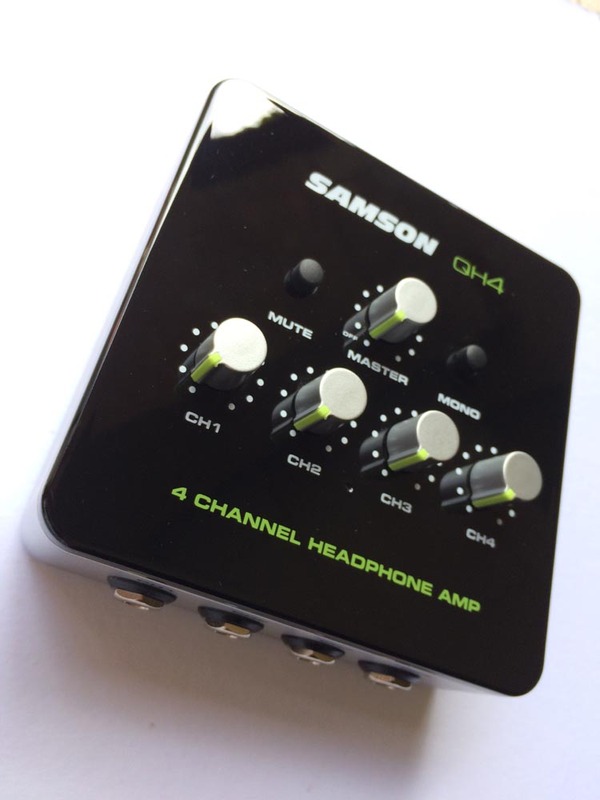 So what is the Samson QH4? 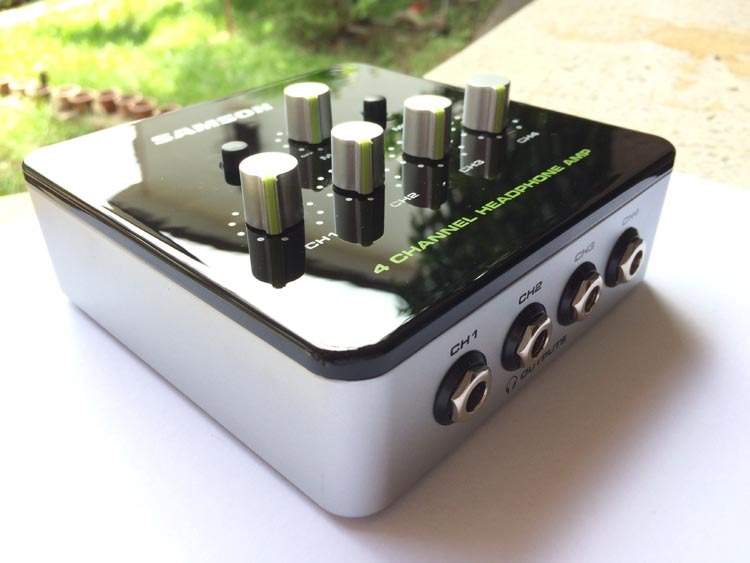 It is a headphone amplifier but more than that, it is an amp that has four separate jacks that are not wired in parallel with each other like a lot of consumer headphone amps with more than one jack usually does. So what’s the difference between having four different amps in one versus something that is wired in parallel? Well, to put it bluntly, there is a big difference. An amp that is wired in parallel may go crazy when connecting a variable impedance headphone that averages around 300 ohms along with a low impedance design for example. The tone of the individual headphones usually changes a bit when running in parallel with other headphones because the amplifier may not be able to deliver good power at all frequencies to both those headphones running at the same time. That’s assuming that the amp works fine when just driving one headphone. So why does Samson make an amp with four separate headphone jacks? It’s actually brilliant and I can’t figure out why there aren’t more products like these around. This amp is targeted towards the home studio market. People making music will usually need separate monitors to hear their instruments in the mix and this is a great solution for that. I know you may ask; Why not connect to their mixer/ console? Not everyone these days will have a mixer board and may just be using a Digital Audio Workstation on their computers. What this does is make musicians able to listen to whats coming out of the mix while they are playing live. It makes them able to hear themselves play or sing along with the other musicians louder and better than what the computer headphone jack can do with four separate connections. Other than that it can be connected in various other ways as well. 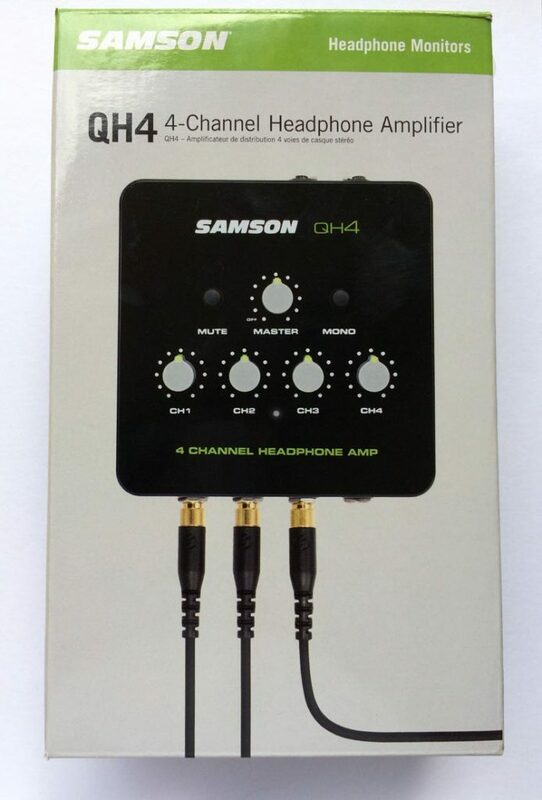 Aside from the target market of home studio/ pro audio people and musicians, the Samson QH4 can also be used as an indispensable tool for headphone reviewers. A/B testing and volume matching different cans have never been quicker and easier. 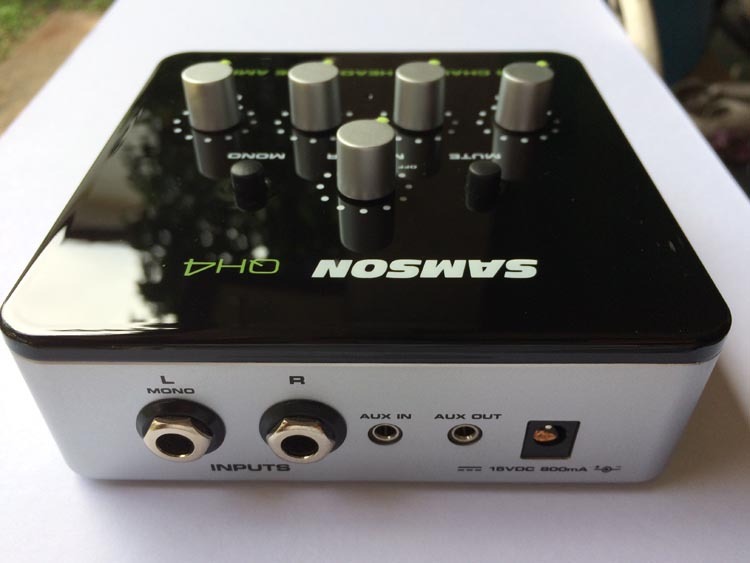 So far as the build quality is concerned, The Samson QH4 is generally at least equal or better than any consumer audio amplifier I have owned or seen at this price point. The knobs are smooth and haven’t given me any static so far. The jacks are solid with no movement or play of any kind. The top has a nice gloss finish but of course, all of the external parts are plastic. I have nothing against plastic though especially at this price point so I will not complain about that. 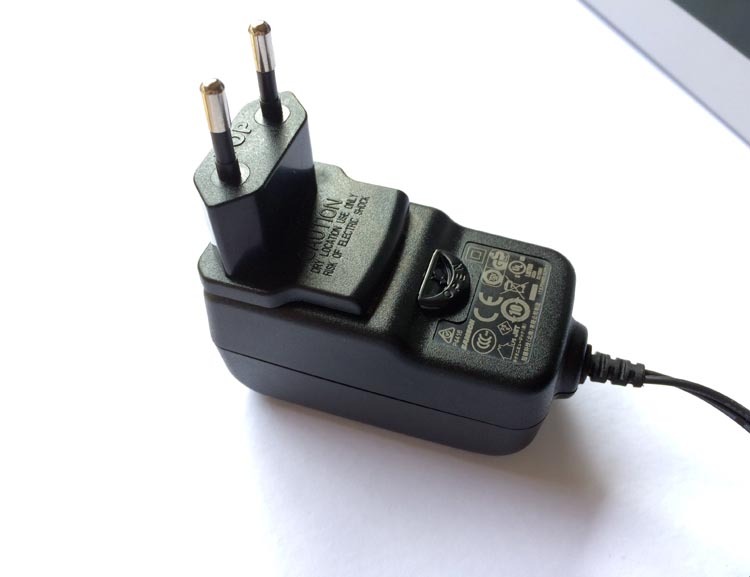 As far as features go, the QH4 has two balanced quarter-inch TRS inputs to connect to a mixer or recording interface as well as a 1/8 inch (3.5mm) jack for connecting a portable player or computer into. Also, like I mentioned above, the QH4 has four independent high-power amplifiers that are meant to be used with headphones ranging from 16-600 ohms. The power output is rated at a modest 282mW per channel at 32 ohms but I never felt it was underpowered in any way even with 300 ohm Sennheiser HD580s. In fact, it felt like it gives out more juice compared to my USB powered LHLabs 1watt DAC/amp. 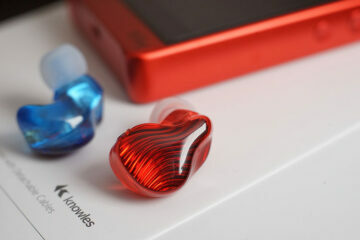 The QH4’s volume capability is definitely much higher than that of the LHlabs GO1000 that’s for sure. Like I said above as well, power does not change even though you are using all four jacks at the same time. There is a volume knob for each separate headphone connection so a total of four plus one main master volume knob. The Headphone jacks are all quarter inch. It also comes with mute and mono toggle buttons. I really found the mono button useful even though I am not using it in the studio to check for phasing problems with recordings. Instead, I use it to make me feel more confident that the headphones on my head are correctly seated with the center image at dead center. Let me start my sonic quality assessment by saying that I usually have very high standards when it comes to headphone amplifiers. High meaning I don’t like it when I pay a lot of money only to find that there is one little thing that ruins the whole performance. I haven’t owned anything over a thousand dollars but I’ve tried many in the past that were highly praised by people at Headfi for example. I’ve posted all these amps for sale because none of them met all my expectations for a complete or even just an unobtrusive musical experience. Some amps felt too clinical yet lacking in soul, some were too bloated, some had good power and drive yet had an electronic sounding edginess making them sound artificial, some were not powerful enough to drive headphones with various impedance loads so on and so forth. There were actually some that had an insane amount of refinement in the highs yet just had no balls to anchor the sound. I would much rather have an amp that just did the tone right even if it missed out on some minor details over something that does one thing extremely well but can’t cut it when it comes to just delivering the music as a whole. Now comes this Samson, an inexpensive little amp that I never expected much out of for 70 bones. The QH4 sounds much better than it has any right to based on all the crap that I’ve heard before out of many much more expensive stuff. Okay, I said fine, this may sound very decent since the headphones I am driving them with are the very easy to drive Audio Technica M40x closed cans that even my iPod can do a decent job with. I really love these M40x by the way. 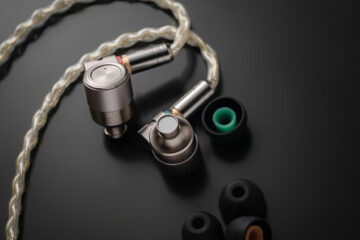 They sound more correct than any closed headphone I have ever heard or owned before including much more expensive models. Back to the amp, I started playing around with it just connected directly double amped out of the iPhone 5s’s headphone jack. It instantly made my M40x sound not only better and more open but the gain, the volume capability of this thing is insane. I love listening to music at very high volumes a lot of the time by the way so this is a major plus for me. Hmm, so now I thought okay, let’s try some high impedance headphones to see if the amp can give them enough juice. I wasn’t really sure whether this amp was any good with high impedance cans since the documentation doesn’t really mention whether the power output increases when the impedance gets higher or lower like most other amps I’ve owned. Typically solid states/ tube hybrids put out more power when the impedance is lower while tube designs typically increase in power capability when the impedance is higher. So now comes some 300 ohm Sennheiser HD580s that my friend lent me. These cans are one of my old favorites and I know their sound well. I have heard the way these headphones react with a variety of different amps that I have used in the past so trying them out with this amp was something that had to be done to check not only how well the Samson does with higher impedance loads, but also to check how the amp changes the sound signature of these classic cans. Lo and Behold, I not only had zero issues with any lack of power and drive but the pairing was great as well. Don’t get me wrong, they didn’t give me the extreme high-frequency detail that my old $600 Headamp Gilmore Lite with the power supply upgrade gave me but these actually sound whole and complete from top to bottom. The only weakness I could find was a lack of some dynamics making the sound have a slightly softer and more cardboard-like coloration than what I remembered from my old headamp Gilmore Lite. Hmm, okay I said to myself I can’t expect too much. Then I thought, let’s try another source. Now to try them coming from a more legit DAC versus directly from the iPhone headphone jack. It may not really make sense to seek out a multi-thousand dollar DAC to try out with a 70 dollar headphone amplifier so I settled with my computer’s USB DAC, the LH Labs Geek Out 1000. So now comes the Geek Out 1000 going into the two 1/4 inch jacks at the back of the amp and the sound quality difference now compared to using the iPhone as a source is almost night and day. No more cardboard boxiness! Dynamics are much better although the Sennheiser HD580 and HD6XX have their limits in that department. Regardless of the limitations, this is still the best I have ever heard the Sennheiser HD580s sound, short of being connected to amps in shows that cost over $1000. It’s not the most detailed sound ever, not the tightest bass vs the expensive stuff, not the most liquid sounding midrange but it gets darned close and all this in a very cohesive and tonally correct way that none of the sub thousand dollar amps I have tried has ever done. So next I try the Samson amp with my Audio Technica M40x closed cans again but now connected to the LH labs GO 1000 and I was floored! I always thought the ATH M40x had a slight weakness in the upper mids and treble being a little unrefined. There was always a certain slightly nasal sound to the ATH M40x’s midrange common in all Audio Technica headphones I have ever owned. The treble wasn’t as detailed and nuanced as a good open headphone like the HD600/580 for example in general from all sources I’ve tried them with before. Now with this configuration… No more treble fuzz, no more nasality. I said “What?” Maybe it is due to the ever so slightly laid back mids of the Samson but it felt more like a fix/ tone repair button than a general matching issue which was a weird yet very satisfying feeling. To add to my findings, I have noticed that the master volume affects the tone a little and my sweet spot is around 2 O’clock to 2:30 on the dial and I adjust the separate gains at the bottom to turn my music up or down. I guess with any volume knob that is not of uber price, there will be some variation in tone as one goes up and down the range in volume. It is not usually easy to double check that on many amps but is simpler on the Samson QH4 since you can match the volume by turning the master and channel knobs into opposite directions for volume matching. If you ask how it affects the sound, I can tell you that I have noticed that the sound gets ever so slightly more laid back and wider with the master volume lower and slightly hotter/ more forward going towards full volume even when compensated with the channel volume to get the same sound level. One more thing that I almost forgot to mention is that this amp had no trace of hiss or noise when used with the HD580 and the M40X headphones that I used in this review. So far as headphone matching is concerned, the Samson QH4 is a good allrounder. I believe that this amp can drive anything if they sound good and loud with both the low impedance Audio Technica M40x and the high impedance Sennheiser HD580. The only situation where I can see them lacking in power is if headphones like the Hifiman HE6 or the AKG K1000 are connected to them. Headphones as power hungry as those two are rare though and most people using them are probably already plugging them into speaker amps or another specialized ultra high power headphone amp in a different price bracket, so it’s not really a big concern here. Now I ask myself whether we are just being fooled by these boutique manufacturers with all their fancy schmancy amps and high prices. I am thinking this because I have had a similar experience with the sound of an old Alesis Pro audio Ipad dock that sounded similarly good as well. Is Pro audio now the way to go? Should we all abandon the audiophile market for amps so that these manufacturer’s step up their game if they charge so much? I don’t know. I have to try more Pro audio headphone amps to know if this is a common thing. Whether the old Alesis I tried or this Samson are just freaks of nature, I do not know for sure but what I do know is that this one is definitely a winner. Bottom line? Pure Awesome! I can’t possibly give a sub-hundred dollar amp higher marks than this. In fact, I would take it over other much more expensive amps any day. Highly Recommended! I haven’t seen any company specs showing output impedance and don’t have any measurements either but in case it matters, I have tried it with low impedance and high impedance cans and the resulting sound doesn’t shift the headphone’s tonality like my old speaker integrated amplifiers headphone jacks that made headphones with highly fluctuating impedance either very bloated and dull to overly bright depending on what frequencies the impedances were fluctuating at. So far as the power output is concerned, I have an Ifi nano BL with me here with similar power specs per channel and these don’t dissapoint. They distort the headphones at about the same spl as the ifi nano BL does but if the headphones need gain especially for very quiet recordings, the samson goes much louder than the ifi volume wise. What’s the output impedance on this model? Also, would you happen to have any measurements to see if the specs on this little guy live up to their claims? Great review. I need another amp like a hole in the head, but for this ballpark price, why not. To be honest, it feels like this has dropped into my lap (when I have one) from the gods as I have way too many headphones, but I don’t want to sell any! Now I can really have fun connecting four at a time and ab’ing between them to find the best for whatever I’m listening to. We need more gear at this end of the dollar-scale being reviewed as with each passing month it feels to me like the headphone/amp world is rapidly losing its soul, with multi-thousand gear being talked about as if it’s multi-hundred. I’m wondering what dac might be the perfect partner to this …? I’m currently using the LH Labs Geek Out 1000 but I’m sure the better the DAC, the better it will be. The Samson doesn’t really seem to have a preference so far as synergy compared to other more colored sounding options near its price point. It just gets out of the way tonally speaking. So just try it with whatever DAC you have then move on from there depending on how much money you feel you wan’t to spend on a DAC. Also if you like to tailor your headphone sound a little via the dac, you may want to choose a specific coloration from a DAC to match your cans since the amp seems to get out of the way in that respect. Maybe you should compare it to HeadAMP 4 by ART Pro Audio. From what I heard, they make good headphone amps too. Nice find. Similar style amp. I think I’ve read some comparisons on another site preferring the Samson over this one but I couldn’t say anything about it myself until I try one firsthand.